Sterling Gun Drills, Inc. announces a new sharpening head for single flute gun drills to increase the range of our Manual Regrind Fixtures to over 2 1/8" (54mm). 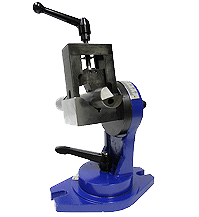 Part # DM-42 Large Manual Sharpening fixture has a range of .75" (19mm) to approx. 2 1/8" (54mm), and is offered complete with the base assembly. Part # DM-42-A, Large Sharpening Head, is offered as an option* for the DM-41 Manual Regrind Fixture. No additional collets or adapters are necessary to sharpen single flute gun drills of any manufacture with the popular “facet” nose grind to virtually any configuration required. Changeover of the standard sharpening head DM-41-A to the DM-42–A large sharpening head on the base fixture involves just two screws to swap the vertical register from the standard fixture to the large fixture. Due to variation in flute shape from size to size and from one manufacturer to another, a fine adjustment feature is built into the clamping wedge that allows leveling the cutting face on gun drills with flute angles from 105º - 120º. A 1/8” hex key is furnished for this purpose. DM-42-I Inserts can be attached to the clamping wedge of the DM-42 using the 10-32 x 5/8" "fine adjustment" button head cap screw. A 1/8" hex key through the access slot removes the button head screw to attach the #1 Insert for sharpening gun drills from .156" (4mm) to 15/32" (12mm). The #2 Insert is used to sharpen gun drills from 15/32" (12mm) to 3/4" (19mm). No insert is used for 3/4" (19mm) and larger gun drills, but the button head cap screw is re-installed to make fine adjustments as detailed above. Existing sharpening instruction is suitable for all diameters. DM-42 + DM-41 A Head assy. Includes the "large" fixture base assy., large head, and standard head allowing gun drill sharpening from .156 (4mm) to 2.125" (54mm).